My E Mailed Questions To Yellowhammers Cliff Sims And Members Of Swatek Azbell Howe Ross » Mr. Dunn Goes to Montgomery | Who's Behind the Mask? From left to right: Tim Howe, David Azbell, Dax Swatek, and John Ross, of Swatek Azbell Howe & Ross. On Nov. 17, I e-mailed Yellowhammer Media president Cliff Sims the following letter. I cc’d it to Tim Howe, one of the partners in Swatek, Azbell, Howe & Ross. I have been provided with some e-mails, including the three below. I’ve also been provided with a 1090 tax form showing that the Swatek, Azbell, Howe & Ross firm have paid one of your vendors. The e-mails and interviews I’ve done reflect that Tim Howe, who uses the nickname “Ghost Writer” in the e-mails, was very involved in Yellowhammer’s video product. One of the e-mails reflects that you assigned him to cover the meeting more than two weeks in advance. He told me that you told him there would be a protest at the PSC meeting and he was to film that. He told me that when he arrived the protesters were not there and he went to sign in and film some of the meeting. He said that he was told by Howe, who was there, that the protesters were outside and he was to go film them. He told me he was paid $2,500, by the Swatek firm, for his work on the “coal movie” and the PSC video. As you are aware, I’m working on a project related to the bogus portrayal of Dunn by various parties, including Yellowhammer, as a liberal environmentalist; and the connected effort to ensure his defeat in next year’s Republican primary. The ultimate purpose of this effort to is to remove Dunn as a threat to Alabama Power’s nation-leading rate of return. Essentially, Yellowhammer News is one of many participants in the effort to prevent a lowering of the rates that Alabamians — rich, poor, senior citizens, small businesses, churches, government agencies and thus taxpayers — pay each month for electricity. As best as I can tell, those involved in this effort do so for financial reasons or to further their personal or political careers. Also, as you may be aware, Swatek, Azbell, Howe & Ross provide political consulting and related work to Alabama Power, the Southern Company, and SouthernLINK. It may be that you do as well. If you wish to comment, you can do so by e-mail or we can talk. I will be available tonight and tomorrow after 11 a.m. I plan to put a story related to these e-mails on my web-site tomorrow afternoon or Tuesday. I make no secret of my point of view and will continue to state it. Eddie – when I decided to do my first “Yellowhammer TV” video, I approached Tim to help. We worked together on a campaign in 2010 and he produced some of the best TV ads of that cycle. I’d never produced a video, so I hired him. I also knew I would be out of the country on a mission trip the week leading up to when I wanted the video done, so I couldn’t be as hands-on during some of the process as I wanted. I think hiring Tim was well worth it. The (coal) video has been viewed almost 50,000 times. As for the issue itself, what I’ve written about Dunn has nothing to do with rates. Heck, I have a power bill, I’d like a lower rate, too. What it does have to do with is Dunn being on the same side as the environmental groups on this issue. Anyone who’s praised by The Alabama Democrat Party and Left in Alabama is no friend to conservatives. You mentioned that you “make no secret” of your “point of view.” Neither do I. I’m a conservative opinion writer who has no problem calling out so-called conservatives who don’t hold the line. I have been provided with some e-mails, including the three below. I will assume you have seen them since I cc’d you the e-mail I sent Cliff Sims. I’ve also been provided with a 1090 tax form showing that the Swatek, Azbell, Howe & Ross firm has paid one of Yellowhammer’s vendors $1,000 last year (the 1090 was from Dax Swatek & Associates). The e-mails and interviews I’ve had with the person (a film-maker/cameraman) reflect that the Swatek firm is quite involved in Yellowhammer. They indicate, among other things, that Yellowhammer hired and supervised the camera man who took the video used in “Environmentalists Protest at PSC” and also the “Coal Movie,” but that your firm paid for the cameraman’s services. One of the e-mails reflects that Sims assigned him to cover the meeting more than two weeks in advance. The photographer told me that Sims told him there would be a protest at the PSC meeting and directed him to film that. He told me that when he arrived the protesters were not there and he went to sign in and film some of the meeting. He said that he was told by Tim, who was there, that the protesters were outside and he was to go film them. He told me he was paid $2,500, by Swatek, Azbell, Howe & Ross for his work on the “coal movie” and the PSC video. In Cliff’s response, below, he states, or so it appears, that he hired you (Tim) to help him with the video projects. While that may be, the photographer was hired by Yellowhammer, but paid by your firm. As you may be aware, I’m working on a project related to the bogus portrayal of Dunn byvarious parties, including Yellowhammer, as a liberal environmentalist; and the connected effort to ensure his defeat in next year’s Republican primary. The ultimate purpose of this effort to is to remove Dunn as a threat to Alabama Power’s nation-leading rate of return. Essentially, Yellowhammer News has become one of many participants in the effort to prevent a lowering of the rates that Alabamians — rich, poor, senior citizens, small businesses, churches, government agencies and thus taxpayers — pay each month for electricity. It now appears that your firm is also part of that effort. 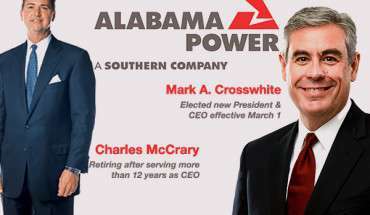 Also, as you may be aware, Swatek, Azbell, Howe & Ross provide political consulting and related work to Alabama Power, the Southern Company, and SouthernLINK, as well as to House Speaker Mike Hubbard. This information is on the firm’s web-site. Also, the firm, through John Ross, donates political consulting services to Chip Beeker’s campaign against Dunn. I plan on reporting these connections and e-mails on my web-site, probably tonight or tomorrow. — Did SAHR Group or its members play a role in the start of Yellowhammer News? – Does SAHR Group or its members provide product for the site, including writing and editing? 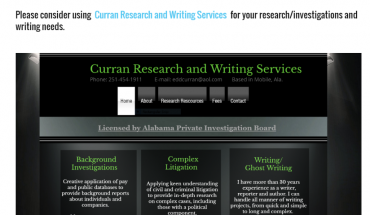 – Does SAHR Group or itsmembers provide or have you ever provided funding for the Yellowhammer site, such as to pay vendors, salaries or expenses? — Has SAHR Group or its members provided writing or editing services for materials published in whatever fashion under Twinkle Cavanaugh’s name since she became a member of the PSC? – Does Howe or the firm dispute the characterization the cameraman’s description of his assignment for the coal video, PSC meeting, and payment, and his interaction with Howe, including Howe telling the cameraman to shoot the protest outside? — Was Howe hired by Yellowhammer for assisting with the coal video, as Sims stated in his response? Was he or the firm also paid for the work or was it provided voluntarily? — Has anyone with SAHR Group discussed the articles, pictures, video and other material about Terry Dunn with anyone working for Alabama Power or Southern Company Services? — Would you (Tim Howe) reject a description of you as being a somewhat regular visitor to Twinkle Cavanaugh at the PSC? – Did anyone with the SAHR Group contribute to Yellowhammer’s “Power & Influence 40,” such as with writing, editing, or selecting those chose? If you wish to comment, you can do so by e-mail or we can talk. I will be available today from 3 p.m. to 9 p.m. I did not receive a response to the e-mail. In late September, well before I learned about the e-mails with the Swatek firm, I sent Sims a number of questions related to Yellowhammer and its efforts against Terry Dunn. I had heard the talk that the site was rumored to be a virtual mouthpiece for Hubbard and as such, a means for him to expand his power and, if it behooved him, use Yellowhammer against foes. But at that point — perhaps due to my paying little attention to state politics in recent years — I’d no inkling of a connection between Yellowhammer, its anti-Dunn efforts, and Swatek, Azbell, Howe & Ross. My interest then and still relates to Yellowhammer’s attacks on Dunn, and thus, those influencing those attacks. I’m especially interested in the protest video on Yellowhammer mentioned above, and showing supposed environmental protesters, their identities concealed by masks. 1. Have you ever called Terry Dunn or David Rountree prior to writing about them, such as to provide them with a chance to address your accusations? 2. If not, why not? 3. You have used PhotoShop or some similar program in photos that go with your stories on Dunn and Rountree. Why did you do this? Why did you not disclose to your readers that you did this (for example, the signs on Dunn’s car)? 4. You have a video — “Environmentalists Protest at PSC” — on your web-site. It shows people wearing masks at a July meeting related to Alabama Power. The point of the video, or at least I think, is to show that there were, at the meeting, a group of liberal environmentalists, and that they supported Terry Dunn and basically hated Twinkle Cavanaugh. Was that a Yellowhammer photographer who shot that video? What would be your opinion of the sort of person or organization who would orchestrate a phony protest in order to use it against a public official? 5. Who are the financial backers of YellowHammer News? 6. Can you provide any evidence directly connecting Terry Dunn to environmentalists? His response was friendly, but did not address any of the questions, at least not directly. Eddie, thanks for getting in touch through the site. I think you probably know by now, but I don’t pretend to be anything but a conservative, and I’m going to call out RINOs when they are taking the side of AEA, environmentalists, or any other liberal groups. My name is Eddie Curran. I live in Mobile, Ala., as I have for most of my life. That included almost 20 years at the Mobile Register. During most of that time I focused on investigative projects, with stories and series on state politics, the courts, and white collar misbehavior. Solve the Mystery the Alabama Media Won’t Touch: Who is X? This project is entirely self-funded and independent. It is journalism, if with a strongly stated point of view: That Alabama Power's governmental relations arm is ruthless, unethical, and corrupt. Donors who contribute $25 or more will receive a DVD of my documentary, "Mr. Dunn Goes to Montgomery." Click here to learn how to donate.